Life on two wheels: Milestone looming! I find it hard to believe. Yet it's plain to see that my dragon red Vespa will soon roll up to the 10,000 mile mark. All but 1,304 of those miles are mine. I'm hoping to post a similar photo when that momentous event happens. I'll have to start paying close attention to the odometer. It's been a busy week for me. I have a more substantial post in the works. This tid bit will have to do for now until I can pull this week's post together. Woo Hoo!!!!! I've put 4,000 k on my scoot since I bought her on January 24 th. Glad you have had happy k's on your scoot. it's funny how it works. 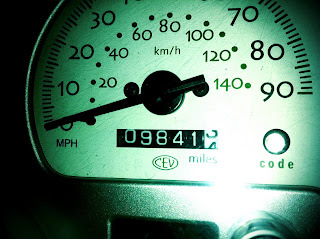 When you have a car you try to keep the mileage low, but on a bike/scooter you try to pile on the miles, take the long way home, make multiple trips to the grocery store, go for joy rides and generally ride without purpose to go nowhere specific. Congratulation to that upcoming milestone. I wish you and your scoot many more safe and entertaining miles.